As we get closer to the start of the 2018 legislative session, I wanted to make sure that you saw the grim truth reported by CBS News. 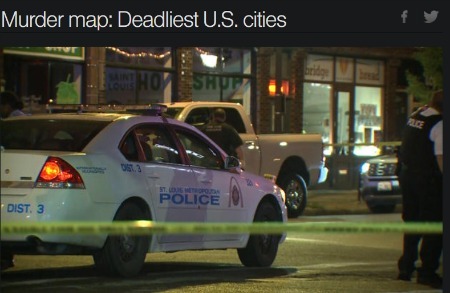 CBS News recently revealed their annual ‘Deadliest U.S. Cities’ report, ranking 63 of American’s most dangerous cities. Care to guess what the murder capitol of the nation is right now? If you said Chicago, you’d be wrong. Same goes for Baltimore, New Orleans, Detroit, or Cleveland -– all of them are safer than our very own St. Louis, the murder capitol of America. Also ranking in in the top ten most dangerous cities for 2017 is Kansas City, at number six! That’s why it’s vital that we END so-called ‘Gun Free Zones’ in 2018! In a moment, I’ll give you a petition to sign to help us do that. As a reminder, even though you and I passed Constitutional Carry and Stand-Your-Ground law last year here in Missouri, we still have almost TWO DOZEN places where you and I are still forced to be disarmed! Hospitals, churches, most sports arenas, voting stations, daycares, most public transit systems –- all of these locations are off-limits to gun owners, according to Missouri law. All of these locations are juicy targets to criminals looking for their next victim. That’s why I’m counting on your immediate action to help us eliminate these so-called ‘Gun Free Zones’ during the 2018 legislative session. As a reminder, our bill cleared THREE House Committees before being shut down last year. But 2018 is an election year! So before your legislator comes around looking for your money and vote, make sure that he supports this legislation first! The best way for you to do that is by signing your petition, calling on your Representative and Senator to co-sponsor and vote for this bill next session! We will be delivering these petitions to the legislature during the 2018 session, but you need to sign yours to make sure your voice is heard! And don’t listen to anyone who tries to blame these numbers on the passage of Constitutional Carry, either! St. Louis was the murder capitol of the nation in 2006, 2010, and 2015 — all long before Constitutional Carry was on the books here in Missouri! Doing away with silly ‘Gun Free Zones’ would be a great place to start ending the out of control violence that St. Louis and Kansas City are experiencing. But while this may seem like common sense to you and me, it’s going to be a major fight in Jeff City as the anti-gun legislators there are digging in for a fight. HELP MOFC STAY ON THE FRONT LINES! EVERY DOLLAR YOU DONATE STAYS RIGHT HERE IN MISSOURI TO FIGHT FOR OUR FREEDOMS! And they are being aided by other anti-gun radicals like St. Louis Mayor Lyda Krewson, who continues to try to blame gun owners for these violent crimes! In fact, just a year ago while an Alderman, it was Krewson who sponsored a city ordinance that would jail gun owners who own the popular AR-15! 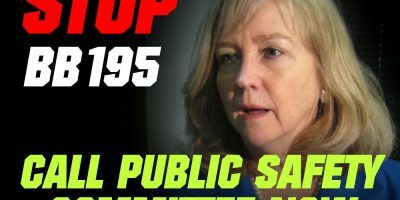 In addition, another one of her proposals would make you a criminal for having a firearm stolen out of a vehicle and not reporting it to the police on Krewson’s timetable! Of course as gun owners in Missouri know, we are forced to leave our firearms in our vehicles all too often because of the ‘Gun Free Zones’ policies in the first place! That’s why I’m counting on your signed petition, to be able to prove to the legislators in Jeff City that they need to pass this bill next year — or deal with gun owners at election time! And when you’re through, I hope that you’ll also consider supporting this fight financially. We are hard at work preparing for the 2018 legislative session. But we also can’t ignore the pressing 2018 elections, where the entire House and half of the Senate will be up for grabs. But mobilizing gun owners through mail, email, social media, gun shows and radio ads adds up –- fast. So after your signed petition, I hope that you’ll consider a donation of $50 to the Missouri Firearms Coalition! If that’s not possible, please consider a lesser number – but either way, I hope you’ll make a donation right away! In 2016, it was grassroots gun owners like you that gave us the ammo we needed to fight to pass Constitutional Carry and Stand-Your-Ground law. You helped us pass THREE House Committees this year. Now I’m asking for your help for the 2018 session! Please do what you can, right away! P.S. A new report from CBS News announced that St. Louis is the murder capitol of the nation, with Kansas City being ranked number six! This confirms what you and I already know, as almost every mass shooting in the last 5 years has taken place in the same ‘Gun Free Zones’ that plague Missouri! Yet here in Missouri, we have almost TWO DOZEN of these locations on the books -– places where you and I are forced to disarm but where criminals can run amok. Please help us end these ‘Gun Free Zones’ in 2018, by signing your petition TODAY! And I hope you’ll also consider a donation to help the Missouri Firearms Coalition get ready for the upcoming legislative session! Please do what you can, today.